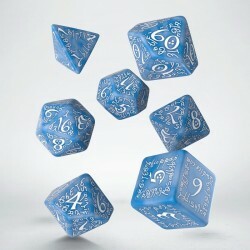 Elvish Dice Set Glacier & White (7) - Games, Toys & more e.U. These dice are so beautiful that this description should be written in Quenya. This language was a symbol of the high status of the Elves, the firstborn of the races of Middle-earth. It’s elven Latin, the language of the most noble race ever. The decreasing of its use also became symbolic of the slowly declining elven culture in J.R.R. Tolkien’s universe. The Q-Workshop dice are a symbol of hope for the elven kind because they have been upgrading them since the beginning of Q-Workshop's history. Every year brings new colors and new improvements in their production technology, their design, and in lifelong painting. All to make the dice worthy of Galadriel's attention. The Elvish sets are Q-Workshop's most precious creation. They are proud of them, and humbly believe that this will be their support for the case of renewing of elven glory and inviting them again to our world.